There's no question that animosity exists on both sides of the political spectrum, but have you noticed how personal it has become for many on the left? But what concerns me as much as this pattern of ill will and abuse from leftists is that it is unchecked by their peers and often applauded. Instead of encouraging people to appeal to the better angels of their nature, they are beckoning them to summon their demons and become part of a mob mentality -- as if we're witnessing a replay of events that preceded the French Revolution. It's unsettling that they rationalize their misbehavior as justified, even warranted. They've convinced themselves that conservatives' views are so noxious they've forfeited any expectation to be treated civilly and they deserve to be shunned, muzzled and boycotted -- especially members of minority groups who have strayed from the reservation. They are "garbage people," "deplorables" and subhumans who are not entitled to equal rights, let alone decent treatment. Leftist mobs violently protest conservative campus speakers and harass conservatives such as Kirstjen Nielsen, Sarah Huckabee Sanders, Pam Bondi, Mitch McConnell and Stephen Miller in public places. Conservatives are censored on Twitter and Facebook. Google, the mainstream media and other social media platforms refused to run ads for the pro-life movie "Unplanned," and Twitter often censors pro-life tweets. Conservative students are shamed into silence on college campuses while their ideas are demonized in the surreal cause of promoting diversity and inclusiveness. Leftist students vandalize pro-conservative posters and seek to eradicate tributes to conservatives -- such as the efforts by students at the Savannah College of Art and Design to remove the name of Savannah native Justice Clarence Thomas from one of the campus buildings because he is "anti-woman." Anti-woman? Just how crazed are these people? Students at the University of California, Davis protested a photo of a heroic slain woman police officer holding a Thin Blue Line flag as "anti-black" and "disrespectful." For some, nothing is sacred, and to those lusting after another opportunity to be offended, everything is a provocation. Leftist protestors pepper-sprayed a group of high school kids meeting about free markets and the Constitution. Though many were hospitalized, the media ignored the event. 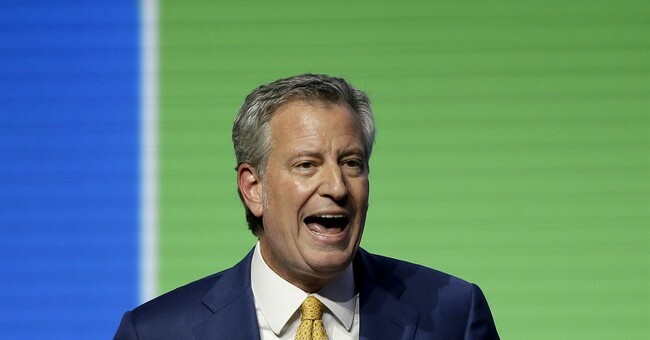 New York City Mayor Bill de Blasio impotently called for a boycott of Chick-fil-A's Manhattan restaurant because the chain owner, Dan Cathy, is a Christian who believes in traditional marriage. If you oppose Obamacare, it's not because you believe there is a better way to improve health care but because you don't want children to have access to it -- as Jimmy Kimmel unapologetically asserted. If you support Social Security reform, you want old people to get sick or die. If you favor border enforcement, you are a xenophobe and a racist. If you oppose abortion, you want to deprive women of their autonomy and health care. This is the kind of pervasive demonization of conservatives that leftists are engaging in every day, which leads to the horrific mentality that it's OK to deprive them of their rights and treat them as second-class citizens. Luke O'Neil, in an op-ed in The Boston Globe, expressed regret that when he waited on Bill Kristol at a restaurant 10 years ago, he did not insult him and spoil his food with urine and blood. Ironically, Kristol is one of President Trump's most ardent critics today, but a decade ago he was the bane of the left because of his support for America's war with Iraq. O'Neil remembered having served Kristol when he learned that Secretary of Homeland Security Kirstjen Nielsen resigned her post this week. He fondly recalled her being "shame-marched" out of a restaurant nine months ago because of the Trump policy that allegedly separates families at the southern border. He suggested that waiters would have been serving America if they had tampered with Nielsen's food. Far from being sorry for his piece, O'Neil later tweeted in response to conservative criticism, "People who carry out policies of ethnic cleansing or cheerlead for disastrous wars leading to tens of thousands of suffering or dead should not expect to be able to show their faces in public anymore thank you for understanding this basic premise." Such unbridled personal nastiness reminded me of liberal writer Jonathan Chait's admission in 2003 that he loathed then-President Bush. What was most striking was not his antipathy but that he knew he risked nothing in sharing it -- that the people whose respect he cared about would approve and think no less of him. He wrote: "I hate President George W. Bush. There, I said it. ... I hate the inequitable way he has come to his economic and political achievements and his utter lack of humility (disguised behind transparently false modesty) at having done so. ... I hate the way he walks -- shoulders flexed, elbows splayed out from his sides like a teenage boy feigning machismo. I hate the way he talks -- blustery self-assurance masked by a pseudopopulist twang. I even hat the things that everybody seems to like about him." The left's extremism -- its embracing of ever nuttier ideas, its sanctimonious hubris, its routine descent into personal ugliness, its relishing of incivility, its willful censorship, its discrimination against Christians and its dehumanization of conservatives and Trump supporters -- is growing at an alarming pace. I pray that adults remaining on that side of the aisle can someday regain control of this careening leftist political juggernaut.